Data acquisition is the process of sampling signals that measure real world physical conditions and converting the resulting samples into digital numeric values that can be manipulated by a computer. Data acquisition systems, abbreviated by the acronyms DAS or DAQ, typically convert analog waveforms into digital values for processing. The components of data acquisition systems include: - Sensors, to convert physical parameters to electrical signals. - Signal conditioning circuitry, to convert sensor signals into a form that can be converted to digital values. - Analog-to-digital converters, to convert conditioned sensor signals to digital values. Each series offers a unique signal-conditioning solution. Take these links to our optimized pdf catalog pages. Choosing the right module for your mounting boards is very important. WRC4 Series Discrete I/O expands WRC’s complete line of discrete I/O modules. 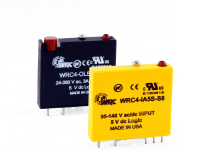 These modules provide an indication LED and replaceable fuse. They also meet an industry de facto standard pin-out. 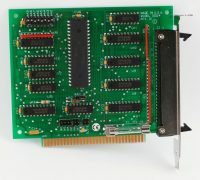 WRC offers an extensive range of mounting boards for all versions of WRC discrete I/O modules as well as other vendors modules. 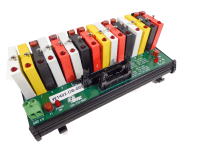 The general types available include: · 1781 slim series of mounting boards are available for 1, 4, 8 , 16, 24 , and 32 points of I/O and provide the space savings available by the use of the 1781 series of slim modules. • 1781 quad mounting boards are available for 24 or 32 points of quad I/O · WRC4 series of mounting boards provide a selection of 1, 4, 8, 16, and 24 points of I/O in different configurations to meet you application needs. • 1771 series of mounting boards are available to handle the slim, and 0.6” size modules in 8 or 16 point configurations. Choose the logic side connection to meet your application from card-edge connector, 50-conductor header connector, or terminal screws for point to point wiring. Mounting options include the traditional panel mounting swaged stand-off as well as the convenient DIN-Rail mounting. Consult the following table for details showing the options available. Custom DIN-rail mounting board sizes may be available. Consult WRC or your local distributor for details. All units are UL recognized and CE compliant. Find products easier by using our Industry Model Numbers, found here. 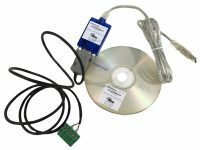 Western Reserve Controls introduces W1492 Series Field Termination / Signal Conditioning Family for direct connection to Allen-Bradley PLCs and Logix Controllers Save money and lower installation costs using WRC’s signal conditioning solutions as a front-end to your Allen-Bradley SLC/PLC/Logix I/O. Western Reserve Controls introduces W1492 Series Field Termination / Signal Conditioning Family for direct connection to Allen-Bradley PLCs and Logix Controllers Save money and lower installation costs using WRC’s signal conditioning solutions as a front-end to your Mitsubishi Boards.